You could be forgiven for thinking the front-page of Wikipedia is sponsored by the Gibraltar Tourist Board, with the territory given the kind of product placement large corporations can only dream of. Now Wikipedia's self-styled "spiritual leader" Jimmy Wales has publicly stated that he wants the Wikipedians' curious enthusiasm for the tiny British territory to be reined in. It's a tale of conflicting and overlapping interests. In June, a British IT consultant called Roger Bamkin signed a commercial contract with the Gibraltar Tourist Board. But Bamkin was no ordinary IT consultant. He was a trustee of the charity Wikimedia UK and had been, until a few week's previously, the charity's chairman. Wikimedia UK is a charity with a charter to promote Wikipedia, and sits on a £1m cash pile from global donations. 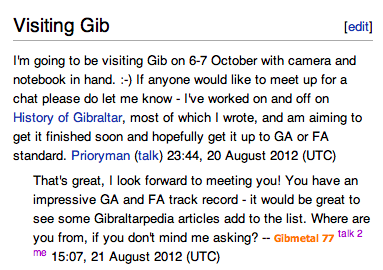 In July, Gibraltar began to feature prominently on the front page section of Wikipedia called "Did You Know?" section. It may as well have been called "Come to Sunny Gibraltar!" Topics rarely make more than one appearance. There were seven Gibraltar articles in DYK in July, and 17 in August, and 12 more in September with Bamkin pushing them to prominence. They stopped appearing only after the connection between Bankin and Gibraltar was revealed by CNet. Bamkin, armed with a commercial contract with the Gibraltar authorities, had helped develop a project called 'Gibraltarpedia' to promote the territory, using software he had helped develop, and owned. Gibraltarpedia was gushingly reported by BBC News Online, and Wales' tabloid Western Mail described how Bamkin chose Gibraltar "after being flooded with invitations from around the world" - but failed to alert readers to his private commercial relationship. Wikipedians pointed out that the private commercial relationships of the charity trustees were not only soiling Wikipedia's reputation, but also putting Wikimedia UK's hard-won charity status in peril. The UK charity regulator, The Charity Commission, clearly states that trustees should not financially benefit from the charity - and "must avoid being placed in a position where their duties as a trustee conflict with their own personal interests." (Rule 43). One threatened legal action. After initially reacting to the criticism with scorn and insults, the Wikimedia charity accepted Bamkin's resignation from the board last month. But after the media scrutiny died down, the high-profile Gibraltar-promotions resumed. After a brief rest, the Did You Know? slot opened for business on 12 October, and you can guess what filled it. Eight Gibraltar-related items have since been featured, including six in six days. You can see an archived list here. What happened? The assiduous promotional work of Bamkin was simply continued by a user called "Prioryman", a veteran Wikipedia adminstrator who had been 'de-sysopped' for repeatedly inappropriate behaviour, and who used to use the handle "ChrisO". "Chris O" describes himself as a military historian, 'Chris Owen MBE*'. In 2010, he claimed the "right to vanish" and re-registered under a new user name with hours, resulting in an indefinite ban. For obscure reasons, the most recent ban was rescinded. Curiously, last month, Prioryman/Owen paid a visit to Gibraltar after the Bamkin scandal broke, announcing that he was going to meet Bamkin's business partner John Cummings. Asked who was funding his trip to the Rock, Prioryman/Owen declined to answer. There is no evidence the user has a commercial relationship with Gibraltar. He may simply be an enthusiast. Now, Wikipedia's co-founder and society figurehead Jimmy Wales has called for the promotions to stop. "I think it is clear that there should be a strong moratorium on any Gibraltar-related DYKs on the front page of Wikipedia. I would recommend a total ban on them for five years, but that might be too extreme. I support that we get wider community attention on the issue," wrote Wales on Wednesday evening. A fuller account of the shenanigans can be found here, which explores the governance implications in depth. Governing the grassroots: desirable or even feasible? "On many important questions that affect Wikipedia’s public standing, Wikipedia is essentially paralysed," writes Wikipedia contributor Andreas Kolbe. "Once a fait accompli has been established by self-interested contributors, as in the case of the Gibraltar product placements on the Wikipedia main page, the site’s system of direct democracy ensures that the instigators have a first-move advantage: they can prevent a new consensus from forming, simply by muddying the water." Wikipedia has been lauded as a self-organising, bottom-up organisation, and in this case it's simply doing what self-organising bottom-up organisations do when faced with diktats from the leadership: ignoring them. So it remains to be seen whether the first-movers in this instance, the British Gibraltar enthusiasts, take any notice of Wales. He lacks the authority to expel them. And perhaps Wales lacks the enthusiasm himself. A fascinating Salon article this week asks: "Is Wikipedia Going Commercial?" But it already is; there's a black market in editing Wikipedia articles. Wikipedia is important and influential, and the market has simply fulfilling a need. But it's a black market - and as with the black market in (say) drugs, people prefer to pretend it isn't there. Surely the Ayn Rand objectivist in Wales would welcome turning this black market into a legitimate one?